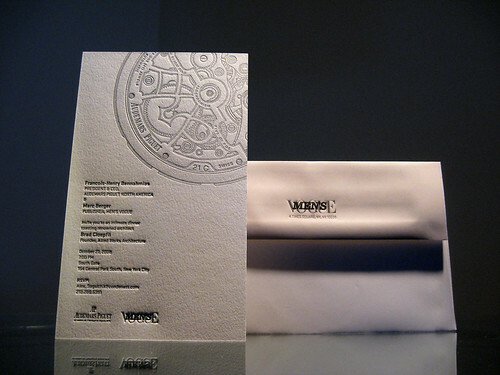 Letterpress invitations for corporate events is certainly not a new trend, in fact we posted a while back about letterpress invitations we printed for First Kentucky Trust’s Open House (see post: corporate letterpress). 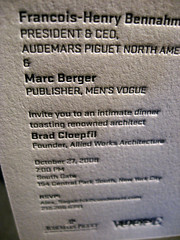 Shortly after printing those invitations we got a call from Men’s Vogue to print these invitesfor a special event. 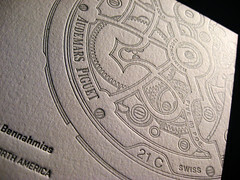 Audemars Piguet, who sponsored the event, makes fine Swiss watches which was the inspiration for the design. 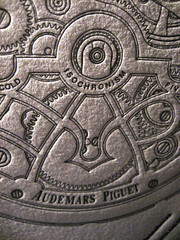 The watch design was printed in silver metallic ink and shows the intricate details of the gears which when letterpress printed provides a unique effect on the paper. Below are some closer pictures of the design which shows the metallic shimmer of the ink and the deep impression we were able to achieve using our thick cotton stock. 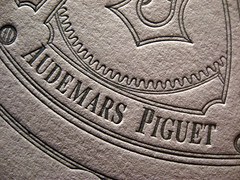 These invites are a great example of how letterpress printing can be used to create a unique invitation and start your event off on the right foot.